Viviscal UK Blog: Q&A: Help! Why Is My Hair Falling out in Clumps? Regardless of age, every woman loses hair. In fact, everyone not only loses hair but loses it all the time—the average person will lose anywhere from 50 to over 100 hairs daily. While everyday hair loss is a phenomenon shared by all, some struggle with more severe or apparent hair loss. If your hair is thinning, breaking or suddenly falling out in clumps, it is understandable to be concerned. What would make your hair fall out in clumps or thin out unnaturally? 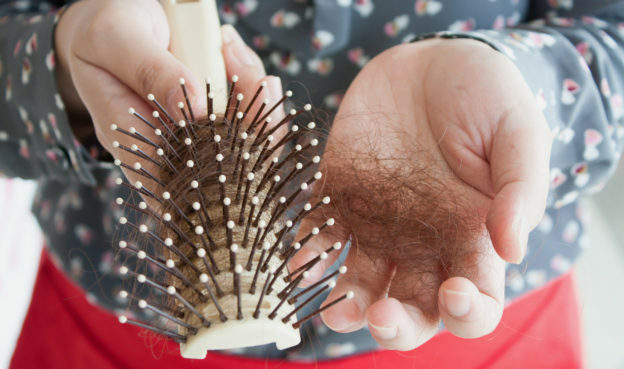 Here’s everything you need to know about the cause of falling or thinning hair, or hair falling out in clumps, and what you can do about it. Most women will find hairs in their shower, in their comb, brush and hair accessories, and occasionally, on their clothes. This is normal daily hair shedding, not to be confused with more serious hair loss. Daily hair shedding occurs due to the natural hair growth cycle, during which old hairs are pushed out to make room for the growth of newer, healthier hairs. The average woman can expect to lose between 100 and 150 hairs daily this way. Note that you may lose a few more hairs than usual after vigorously washing, drying or brushing your hair—this is also normal and to be expected. However, if you see that you are losing significantly more hair than the daily average, you may be suffering from abnormal hair loss or androgenetic alopecia. Why Is My Hair Falling Out In Clumps? The most common cause of severe sudden hair thinning and hair loss, or hair suddenly falling out in clumps, is an underlying medical condition, illness or disease. Any number of conditions and illnesses, including the positive (pregnancy) and the more problematic (inherited conditions such as hypothyroidism) can contribute to hair loss. If your hair is falling out in clumps, it is important to consult your physician in order to rule out any medical conditions. However, medical conditions are not the only, nor the most common, reasons for hair loss. Your lifestyle and the way you treat your hair can have big effects on hair loss as well. What Else Would Make Your Hair Fall Out In Clumps? Having your hair fall out in clumps can be alarming. That said, it is important to remember that there a wide variety of factors that can lead to hair loss, and any combination of them can be responsible for your thinning hair and clumps of hair falling. If your hair is falling out in clumps, not only your physical health but your lifestyle could be to blame as well. If you’re wondering what would make your hair fall out in clumps, don’t discount stress. Sudden emotional or physical stress – even if it’s seemingly minor – can manifest itself with physical symptoms, such as abnormal hair loss. (In fact, very severe stress can cause you to lose up to three-quarters of all your hair!) The condition of stress-related hair loss is called telogen effluvium, and it can occur weeks or even months after the initial stressful event and it can take anywhere from six to eight months before hair begins to grow back. Another thing that can cause your hair to fall out in clumps is a lack of proper nutrition. A good diet is essential to healthy hair, and a lack of certain vitamins and minerals can contribute to hair loss. A severely poor diet, or malnutrition, can cause your hair to fall out in clumps. Hair is considered a “non-essential” body part, so when the body is lacking a certain nutrient, hair growth may enter a “resting” phase in order to conserve protein until this missing nutrient is restored. This “resting” phase not only means that hair doesn’t grow, but that it is more likely to fall out. To address this, make sure you enjoy a daily diet rich in vitamins and proteins. You may want to add a hair supplement such as Viviscal to your routine too. A hair supplement will give your hair all the nutrition it needs, complementing and encouraging the growth of new, healthier hair. What Should I Know About Hairstyling and Falling Out Hair? Aside from nutrition, and physical and mental health, the last thing that can affect the way your hair grows (or falls out) is how you treat it on a day-to-day basis. The way you treat and style your hair can contribute to hair thinning and loss and could be one of the causes of your hair falling out in clumps. Washing your hair too frequently or with heavy products can lead to thinning hair and even cause some of it to fall out. Excessive brushing will pull out lots of hair, even healthy hair you want to keep. Similarly, you can damage your hair by pulling it back to tightly (which causes thinning and breakage) or tying it too tightly (in braids, in an updo, or in a similar style). If you enjoy wearing your hair tied back, be sure to let your hair down every once in awhile and make sure you keep your hair ties loose. Additionally, heat styling tools and treatments such as straightening or curling irons, dyes, hair dryers, etc. can cause serious damage to your hair. The heat and chemicals found in many tools and products can make hair dry, brittle and dehydrated. Be sure to regularly moisturize your scalp and hair to guarantee follicles stay healthy and hydrated. Be selective in the products you use and the frequency of hair treatments you do. When it comes to hair, often less is more.